The sweet “sirens” of caffeine addiction were calling out to me as I poured my second cup of coffee, realizing that it was time to wake up Farts, a nickname I had given my sister when we were kids. When she was really little she used to sit on my father’s lap and watch TV. My dad was not at all discreet about his bodily functions, so he would let one rip and start laughing right before Kristy said, “Dad, I LIKE farts!” Of course as an American, beer drinking, Three Stooges loving, blue collar working male, he found the comment absolutely hilarious, connecting with his prima donna toddler on a whole new level. Kristy and I used to play an old version of Jeopardy on the home computer, back when an Intel 386 was as close to lightning speed as we could possibly imagine. We had to name our own contestants and I would always sneak in her contestant’s name before I called her down to play. As soon as she sat down, the cartoon version of Alex Trebek would say, “OK, Farts, pick your first answer,” and I would burst out laughing. She would sit there giving me that “this is SO unfair” glare, gritting her teeth as she sat next to me fuming mad, but continuing to play anyway, because restarting the game could take up to twenty minutes. I headed up the stairs with the intention of rising my mother and sister. They were both overly exhausted and probably could have slept all day, no one eager to confront the next task: going over the details of Gram’s funeral. The door to my parents’ room was slightly ajar and I could see my mother sleeping on her side through the crack. I gave a soft knock as I nudged it open so she wouldn’t be frightened. She struggled for a second, trying to appear more awake than she really was. “We have to leave in an hour.” I whispered. She nodded in response and I backed out of the room recognizing the role reversal that at some point happens between parents and children. Kristy appeared in her doorway like a more attractive, female version of Archie Bunker, slow moving and groggy, before I had made my way across the hall to wake her. “You didn’t need to be woken up after all,” I joked. “Yeah, who would want to miss this,” she smirked and shuffled towards the bathroom. None of us were what you would call “morning people,” we woke very slowly, moving about with a slightly forward leaning gait and foot shuffle, not speaking in full sentences for at least the first thirty minutes. Gram and Kim were the exceptions. As far back as I can remember, Gram was alert and ready to go before sunrise, maybe because that was the only time of day a widowed mother of four had an actual moment of solitude. When I was about seven years old, McDonalds introduced their first line of refillable plastic coffee mugs. For some reason, Gram thought these new mugs were just awesome. If you arrived at the restaurant before 6 in the morning, for the early bird special, you would receive a free travel mug with the purchase of breakfast. Since the family only had one car, and neither my Mom nor Dad worked weekend mornings, we were guaranteed the use of the car both Saturdays and Sundays. Gram and I would wake up at 5:30 a.m., making sure that we were silent enough not to wake Kristy. It was fairly easy since Gram and I shared a double bed. We would have our clothes ready the night before, carefully planning our escape from the house without anyone else knowing. If splitting a plate of sausage and pancakes wasn’t exhilarating enough on its own, being the secret accomplice in deceiving my sleeping sister was enough to make this seven-year-old feel ecstatic. I remember the pride I felt when we shared our “secret breakfasts,” moments that were just ours. During those stolen meals, I had won the daily battle of “who gets Gram,” an unspoken possessive power struggle between Kristy and me throughout our childhood. We were always pulling Gram in opposite directions, hoping she’d secretly like one of us better. Fortunately she had enough love to divide between us equally, and solved the problem by making each one of us feel like we were individually getting more than the other. When the five people could no longer comfortably fit in the four-room cottage, my parents doubled the size of the house by adding a second floor. The new upstairs had three bedrooms as well as a second full bathroom and compared to the tight living quarters I had been used to, I remember feeling as if we now lived in a mansion. My parents had the master bedroom, while Gram and Kristy got twin beds and moved into the larger of the other two bedrooms. My room was a little bit smaller but came with all the privacy a nine year old would require. Having my own room was a great idea in theory, but deep down I was insanely jealous of my sister sharing her room with Gram, because I was the oldest and thought Gram was all mine. I came up with a fantastic way to trick my sister out of having Gram and Gram must have found it fun because she went right along with it. The nightly plan unfolded like this: Gram would pretend to go to bed in Kristy’s room, going as far as getting under the covers and faking sleep. When she was absolutely sure that my sister was sleeping, I gave her strict orders to silently tiptoe into my room and spend the rest of the night in my bed. I even kept one of Gram’s favorite feather pillows in my room to make the trip more enticing. To avoid any conflict between her granddaughters, she would have to wake very early and return back to her other bed. I don’t remember how long this crazy routine actually went on, but I imagine that it meant as much to her as it meant to us and on the life long list of things that really matter, it was worth all of the trouble. If she wasn’t mad at me for teasing her, Kristy and I would sit together at the top of the hallway stairs, playing Uno or Barbie dolls, sometimes just talking and enjoying being with each other. In my room we would make a tent out of blankets, draping them from the brass footboard and hiding underneath, spending the night cuddled up in a ball as we shone our shiny metal flashlights on the wall, making shadow figures and giggling while trying to scare each other. It was easy to get the spooks as I told stories of the lonely old ghost woman who cried out in the night, “Who stole my golden arm?” making the sound of wind whooshing and tapping on the blanket as my sister jumped out of her skin. On schooldays Kristy would come into my room before she left the house and ask my opinion on her outfit. Some days I would not pay close attention, mumbling that her dress was fine as I focused on something else. I was a teenager with a bustling social life, busy focusing on who had broken up at school and what our clique was doing on Friday night. I had more important things than my little sister’s wardrobe to focus on. “What do you think of this?” she’d ask as I blew her off, looking for my other pink Converse All Star high top under the bed. “Yeah, that’s good.” I said in an unconvincing tone, still not giving her my full attention. “Would you wear it?” she spat back, her hands perched on her hips with her lower lip stuck out, intensely waiting on my response as if I was the fashion mogul of the world and my opinion would make or break the outcome of the day. If I said no, or even implied it with a smirk, there would be thirty more minutes of rummaging through the closet for the appropriate attire of the day, tops, skirts, and leggings strewn every which way all over the floor, looking as if someone had been on a crazed rampage searching the closets for hidden treasure. Eventually I would give in, going in her room and offering up advice. “You can’t wear a tight fitting shirt with tight fitting pants. If you want to wear those leggings than you need a shirt that is kind of loose. It’s the rules. Here, try this one.” When she left the house, she left feeling confident. Secretly I was, too, but would never admit that the older sister liked playing dress up with a real Barbie. My mom would do Kristy’s hair with the back down and a ponytail at an angle on one side, kind of like Punky Brewster. 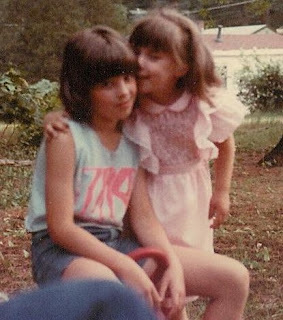 What Mom didn’t realize was that by the third or fourth grade the Punky Brewster look could put a huge target on Kristy’s back. With that hairdo and the large round blue glasses she wore, my poor little sister had no chance of being one of the cool kids at school, even though Mom and Betty swore that they read the fashion magazines and these styles where what everyone else was wearing. I was never fully sure that they were reading the “current” fashions. Having been the different kid for years, I knew on a deep level that school taunting to some could be considered “character building,” but I didn’t want her getting picked on like I did and would sneak my sister in to my room to re-do her hair, letting it down and brushing it out, using the curling iron to give it a little extra body. It gave her a more mature and sophisticated look rather than like she was going to ask to join the Double Dutch game. “There ya go….” I would say as I finished up, running my fingers through the base to separate the curls. We did this routine a few times a week. Sitting on the bench of my walnut armoire, I watched her confidence grow as she viewed her reflection in the mirror. Her face lit up as she thanked me and ran off. Since I was cool in her eyes, whatever I did was obviously superior to anything she or Mom could do. Mom told me that when I left for college Kristy cried every day and slept in my bed for four weeks. I thought our relationship would always stay the same, even though I wasn’t around as much; we could talk on the phone and visit every few months, but somehow that wasn’t enough. We grew apart and she started to close herself off. Looking back I think I acted as a sort of buffer amidst the oil and water relationship between my sister and mother. I wondered if on some level she felt like I abandoned her, leaving her there to fight all the battles on her own. We had always been a team, she and I, taking it on together. I hated that I missed being an active part of her teenage years, but I was 5 ½ years older, and at that age the difference was tremendous. When I was available again, after chiropractic school, it was too late, that space in her heart had been replaced. She had found Matt and gave all the trust she had in me to him. Nowadays we could go months without talking, and even though we got along great when we were together, those occasions were so rare that our relationship didn’t have the same strength. I wasn’t the one she called when she needed an open ear, and I hated that my leaving in 1994 had caused such irreversible damage. It seemed like she no longer needed me. In Atlanta, I lived far enough away that I could consume myself in other things, pretending that the emotional distance between us didn’t hurt as badly as it did. That is until I met Kim and witnessed the closeness she shared with her Mom and three sisters. Even though they all lived in separate states, they managed to talk several times a week, keeping active in each other’s lives. If one happened to visit without the others, they would call all day, their excitement traveling over the phone line as they checked in, making sure whomever made the flight, jealous of what they were missing even if it only involved sitting around the table and catching up. They all appreciated the time they spent together and their closeness had value. I wanted to feel that again with Kristy. It was rare that my sister and I were both home without our spouses, reminding me of the forgotten dynamics of our relationship that got tossed aside in the busyness of our adult lives. Somehow time changed us, affecting things I usually don’t have the nerve to bring up when we are actually talking. But right then we were those sisters again, Farts and Doobla, the girls helping to hold the family together.